Auto Insurance - Lanes Insurance Inc.
Auto insurance coverage is mandatory in Alberta and all Canadian provinces and territories, and works to protect everyone on the road. If your vehicle is damaged by an accident, fire, theft, or other covered event (like hail), a comprehensive car insurance policy will make sure you stay mobile by providing for repairs or new vehicle. Auto insurance policies also offer coverage for medical and legal expenses subsequent to injury, loss of life or property damage that was the result of an accident involving your vehicle. You can get your Calgary auto insurance at a rock-bottom price from an insurer that gives you the hard sell on what a great deal they’re offering, however, you may be disappointed if you have to file a claim. Who will help you if you disagree with your insurer? Is this a risk you are willing to take? By doing business with Lane’s, you are sure to get the best coverage at a competitive price from an insurer that has the ability to process your claim promptly and properly. If the claim does become derailed, with a phone call to a Lanes representative we will get things put back on track. Your auto insurance policy is a contract between you and your insurance provider. In your policy, specific financial losses are detailed for which your insurance company promises to provide compensation in exchange for your annual premiums. And how are insurance companies able to pay for accidents and provide for liability issues? When you buy insurance in Alberta, you’re essentially pooling your money in with that of several thousand other policyholders who your company has determined to be about the same level of risk as you. That collection of funds is then used to pay out genuine claims. Because there are usually far fewer people making claims than there are paying into the total pool, insurance providers are able to cover the financial fallout resulting from accidents, injuries and property damage. Auto insurance coverage is mandatory for all drivers, and the basics include Third-Party Liability coverage and Accident Benefits. Third-Party Liability covers you for accidents you have caused that result in injuries, fatalities, or damage someone else’s property. Through this coverage your provider will make any payment or remuneration required on your behalf, and also defend you if a civil law suit is filed. Accident Benefits cover you if you incur additional expenditures after an accident such as the cost of physical therapy or rehabilitation, loss of income due to not being able to work, and medical or death expenses. Accident Benefits also provide protection in the event of an accident with an uninsured motorist or unidentified vehicle. In Alberta, accidents resulting in $2,000 or more of property damage must be reported to the police, and it is a good idea to always inform your insurance provider regardless of whether or not you want to make a claim. As with every type of insurance, the value of the property owned plays a part, as well as where you park your vehicle, how much you drive, security features, etc. The make, model and year of your car, the records of people who are insured to drive it and where you live are all considered by insurers when setting rates. Value of vehicle: If you are driving a higher value vehicle that you want to keep well maintained and own for a long time, you may want to consider comprehensive and collision coverage. Collision Insurance: This type of coverage pays for damage caused to your vehicle in an automobile accident, and covers any repairs up to the fair market value of your car. Comprehensive Insurance: Comprehensive coverage provides for repairs for damage caused to your vehicle by perils other than collision or upset. Vandalism, flood, hail, theft, windshield damage and fire are all examples of events usually covered by comprehensive automobile insurance. Like collision, comprehensive will pay up to the fair market value of your car (less your insurance deductible). Comprehensive coverage may also include glass coverage for windshield repairs. And, although it’s not legally required by any province, it is a smart idea to have comprehensive insurance if your car is financed or leased. Deductible: A deductible is the amount of money you are required to pay toward repairs before your collision insurance kicks in. 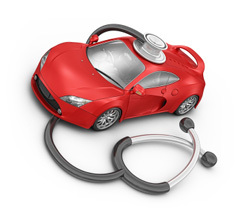 The higher the deductible you’re willing to pay, the less your collision coverage will cost. Purchase vs. Financing: If you are financing your vehicle, the financial institute will most likely insist that you have this protection included on your plan. Risk: Driving safely and with a high level of awareness will reduce your risk of receiving a ticket or getting in an accident. Drivers with a high number of traffic infractions on their record are considered high risk by insurance companies, and will pay more for their premiums. When dealing with Lane’s, you are sure to get the best coverage at a competitive price. As an accredited brokerage, we are able to browse through the products of a number of the country’s top providers to select the optimum policy that meet your needs. And if you ever have to make a claim, our customer care representatives will make sure everything goes smoothly.